UD The Cup Exquisite Hockey 2015-16 - Material Signature - Guy Carbonneau /135 ! 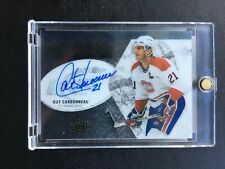 GUY CARBONNEAU SIGNED UPPER DECK MONTREAL CANADIENS CARD AUTOGRAPH AUTO!! GUY CARBONNEAU SIGNED UD PARKHURST CHAMPIONS MONTREAL CANADIENS CARD AUTOGRAPH!! MONTREAL CANADIENS HIGH QUALITY FRIDGE MAGNETS!! U-PUCK!! 24 DIFFERENT!! 15-16 The Cup - GUY LAFLEUR / GUY CARBONNEAU Dual Auto GU Sticks 8/10 Beauty! !